It was 1990 and the last thing on Mark Greenside's mind was living and working in France. But during a VCCA residency that spring, he met Fellow and poet Kathryn Levy, whose innocent suggestion that they travel to France, literally changed the course of his life. "Kathryn is a Francophile, fluent, a lover of most things French, except their politics," said Mark. "It would not have been a surprise to anyone who knows her—except, of course, me—that she wanted to return to France, to Brittany, where she’d been before, and wanted me to go with her. I’ll Never Be French is the story of our trip over and the first few years of my life in Brittany. " I'll Never Be French will be published in November by Simon and Schuster. Order your copy today! The plein air painting workshop at the VCCA's studio center in Auvillar, France, led by VCCA Fellow Danny Hauben, came to a close today, marking the end of another successful workshop in this new, fledgling program. Six participants from Virginia, New York and California traveled to the tiny village to paint outdoors in what has been officially designated as one of France's "100 most beautiful villages." Our 2009 season will be announced later in the fall, so please check back periodically. 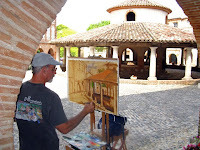 Pictured here: Danny in the historic town center's round marketplace. Fellows, ever wonder how you can support the VCCA without opening your wallets? 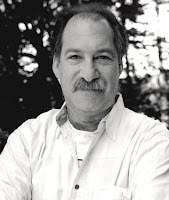 Do what writer Tom Piazza did—tell the world how the VCCA feeds your creative spirit, impacts your creative process, and helps you complete your work. 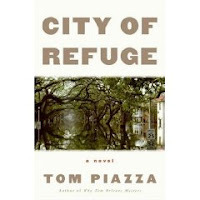 Currently on a 22-city tour for his most recent novel, City of Refuge, Tom is playing up the VCCA in bookstores, and even online. See how he lauded the VCCA on amazon.com. Follow the link and scroll down to "The Story Behind City of Refuge." Thanks Tom, for spreading the good news about VCCA. With four composers currently in residence, there is plenty of music in the studio barn. 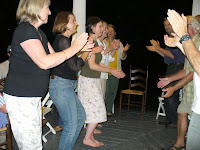 But last night there was even more when a group of area bluegrass musicians, including Fellow and painter Ryan Russell from Lexington, gathered on the gazebo, sharing the traditional music and dance of the Blue Ridge. When Fellow Florence Bernault (writer, Madison, Wisconsin) heard the group at Sweet Briar College, she invited them to play an impromptu concert at the VCCA. Led by SBC librarian Joe Malloy, Ryan, Bo Hughes, Tom Williams and Kathy Williams arrived with their fiddles, guitars and banjos and picked, strummed and sang for two hours, crescendoing with a rendition of the Virginia Reel (pictured here), which Joe called in true bluegrass form. Ryan's wife, Fellow and painter Agnes Carbrey was on hand as well, sketching the scene. Our synergistic relationship with Sweet Briar College knows no bounds! We are grateful for all the ways we engage each other.